The enormous number of people who work only part-time for economic reasons is one the tragedies of the unemployment crisis in this country. It didn’t even start with the financial crisis. Before the 2001 recession, there were a little above 3 million of them. By September 2003, as the economy recovered, there were 4.84 million. Gradually, part-timers got fulltime work, and their number zigzagged back down. In April 2006 dropped, it below 4 million, but only briefly, then edged up again. It never returned to the “normal” that was before the 2001 recession. Then came the financial crisis, and as layoffs soared, some of the lucky ones who got to stay on were cut to part time. Many of the unemployed, once they found jobs, found part-time jobs. And the number of involuntary part-timers just exploded. It peaked in March 2010 at 9.22 million. It had nearly tripled from the year 2000 and more than doubled from before the financial crisis. Since then, it has been declining in spurts and starts, as more part-timers found full-time work. In March, it reached 7.41 million. Nearly five years after the end of the recession, there are still 80% more involuntary part-time workers than there were in 2007, and 130% more than in 2000. So the hope is that somehow – relying on a major miracle perhaps – this zigzag line will continue to trend down for the next 15 years! Because that’s how long it would take at this rate for the number of involuntary part-time workers to get back to where it was in 2000. But that’s a pipedream. The number of part-timers jumps during every recession as companies are cutting some jobs entirely and are reducing hours for other jobs. And there will be more recessions over the next fifteen years, and each time, the number of involuntary part-timers will jump, and the chart will look uglier and uglier. There are other forces at play. It’s as if companies had been using the last two recessions as an excuse to make their workforce more flexible, using people only when absolutely needed, on irregular schedules, and keeping them on stand-by the rest of the time. This is a powerful tool in bringing payroll expenses down. It makes the company look awesome on paper. It wreaks havoc on the lives and incomes of workers and is terrible for the overall economy. The same structural principle is at work with temporary full-time workers. In September 2003, as hiring finally kicked off, there were 2.26 million temps of 130.3 million total nonfarm employees. By summer of 2006, the number of temps had jumped 17.8% to 2.66 million while total nonfarm employment had risen 4.9% to 136.6 million. Then the number of temporary workers began to decline, which was seen as a good sign as the total number of employees was rising; businesses were shifting to regular hires. 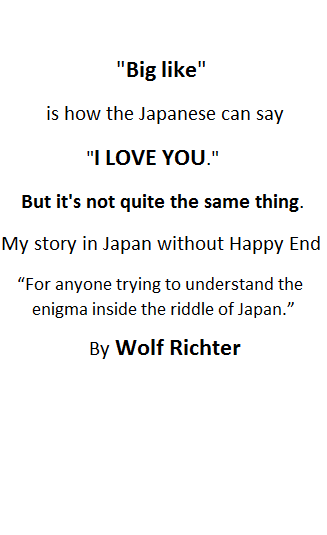 Or so the story went. But businesses were already having demand issues. The housing construction bubble had started to implode. And for whatever reason, companies started to shed temporary workers. 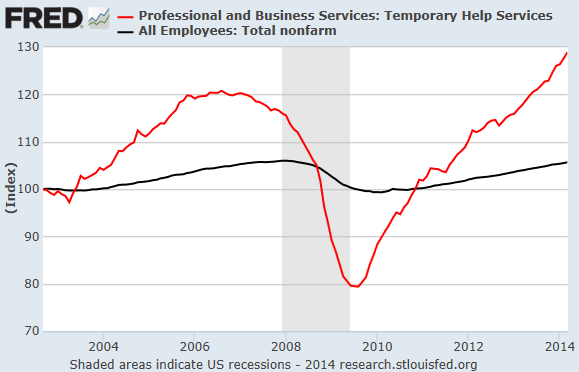 The chart (indexed to 100 for September 2003) shows that temp jobs disappeared firstest and fastest. Shortly after the recession, they bottomed out at 1.75 million while total employment bottomed out at 129.7 million in February 2010. So far so good. Then the structural changes became apparent. Temp jobs have simply and relentlessly been rocketing ever higher and hit 2.84 million in March, up 62.4% from the post-recession low. Total employment grew as well, but at a stately pace, and reached 137.9 million, up a measly 6.4% from the low. 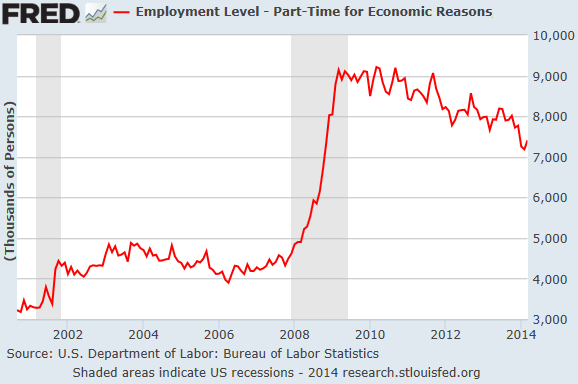 Now there are 3.4 million more part-time jobs and temp jobs than there were at the employment peak before the crisis. Temp jobs are still rising, and at a much faster rate than total nonfarm jobs. There are no signs of a letup. Temp jobs are booming for structural reasons: workforce flexibility and savings on payroll and employee benefits. For companies, it looks awesome on paper. Analysts hype the associated lower costs when they’re trying to rationalize stratospheric earnings multiples. And executives get big fat bonuses for this sort of thing, however damaging it may be for the company and the economy in the long run. Hoping that this trend would suddenly turn around, that temporary workers would suddenly and massively become regular employees is as much a pipedream as hoping that the number of part-timers could return to the halcyon days of 2000. These are structural shifts, brought about by how executives are being rewarded and by how analysts tout stocks. And no amount of Fed money printing and interest rate repression, despite the Fed’s endless declarations to the contrary, can overcome them.